Spring has sprung in more ways than one! 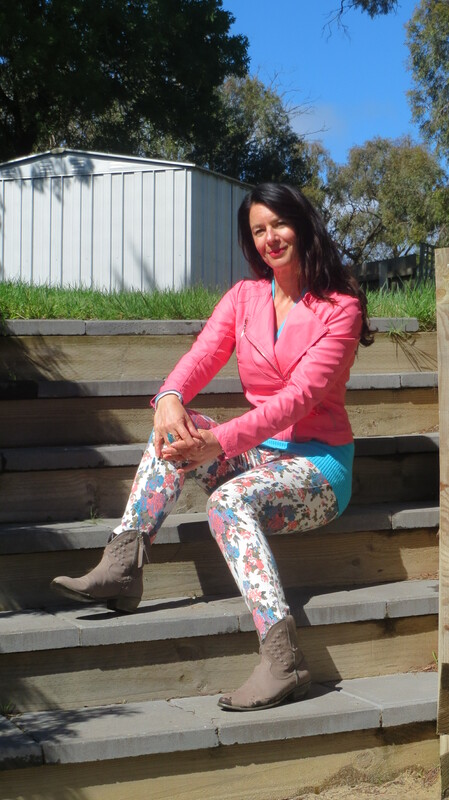 Floral prints and bright colours are still making a statement and I’m determined to make the most of it. While I’m bouncing around in this uber-brightness, a good friend is enjoying the birth of spring lambs in her paddocks. The spring blossoms are in full bloom and I’m being swooped by pesky Indian Myna’s (a small grey bird) every time I go for a walk. Boarded a train into the city yesterday with my favourite, indefatigable shopping buddy – Mum. We found the people watching rather boring, with most people in black and grey, but the bargains were bountiful. 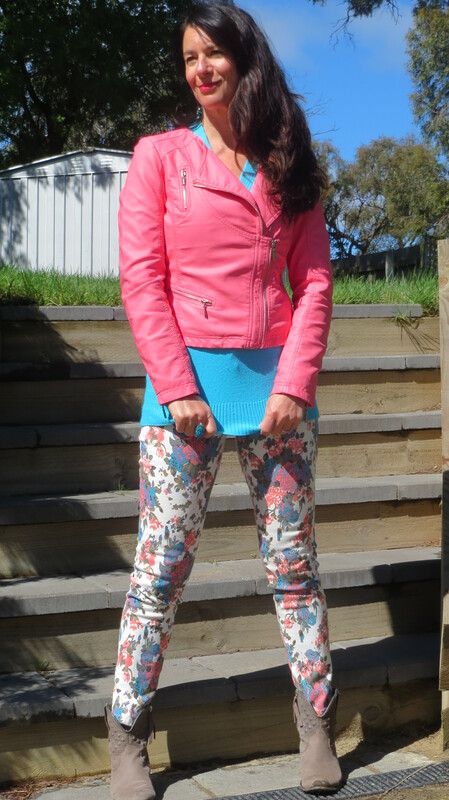 These floral jeans were a spectacular bargain and the bubble-gum pink leather jacket was too good to resist. After an emotionally draining couple of weeks, coupled with pounding the pavement for hours yesterday, I need a good sit down and rest. Got a big pot of vegie soup (threw in some bacon bones and pasta) on the stove bubbling away and I need to whisk my boys off to the hairdresser shortly to tidy up their winter hair. I hope you’re all fighting fit! And now you’re Looking Good Girls. “Look! I see four men walking around in the fire, unbound and unharmed, and the fourth looks like a son of the gods . . . They saw that the fire had not harmed their bodies, nor was a hair of their heads singed; their robes were not scorched, and there was no smell of fire on them.” Daniel 3: 25 & 27b. I have a pink leather jacket, too. Great minds think alike! 🙂 Such a fun color and you wear it well. I’ve got my outfit together, but I seem to have lost your email address to send them to. I tried sending them to your facebook page… not sure it those went through or not, but here is my email address: remnantworks@comcast.net. I will gladly send them again.